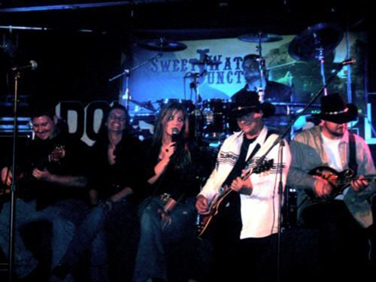 Sweet Water Junction Band is proud of its history. In fact there is so much history to this family band that it can’t be written in one letter. This page will go back to the very start of this band's musical journey. practice during the depression) and joined the CCC in Seattle, Washington. This was one of President Roosevelt's New Deal plans to help people help themselves during the harshest of economic times called Civilian Conservation Corp (CCC). After a few years in Seattle, Porter set out for the Midwest, he worked his way through Chicago, Illinois and in 1936 ended up in Fort Wayne, Indiana. There he found a multitude of work and called for his family to move up from Kentucky to this “prosperous” industrial city, and they did. By 1949 Porter was working with bands that opened doors and future possibilities for his son, David, as he started his career in music. 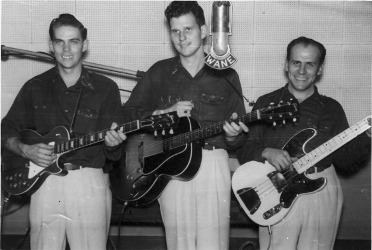 Porter performed many times with Slim Adams while in the Midwestern Trio, on the historical live Chicago radio station WLS, for the National Barn Dance. The group including Porter, was also a regular every Saturday morning on Fort Wayne, Indiana’s WOWO live country music program and radio station WANE. With the Midwestern Trio, played with some of the legendary greats from those days like Roy Rogers, George Jones,Tex Ritter, Little Jimmy Dickens, Carl Smith, Porter Waggoner, Roy Acuff, and Ferlin Husky to name a few. He played numerous times at the historical Buck Lake Ranch, in Angola, Indiana, known as the "Nashville of the North". Porter was also a Co-Writer of a song that Tex Ritter had charted in 1951. 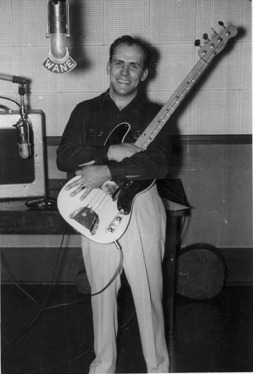 Also in 1951 Porter who just happened to be in Nashville "in the right place at the right time", was given by Leo Fender of the Fender Corporation, the 3rd Fender Bass off his assembly line for him to try out publicly as a country Bassist. It was a Fender Precision Bass, the 3rd of it's kind. The first being in Leo's Possession with the second one still in the factory. You can see the bass in the picture above with Porter holding it. Interestingly enough, several later years Porter lost that same bass in a poker game! Being one of the early pioneers of Country Music, Porter's name was in the the Old Country Music Hall of Fame before the fire and subsequent move. When you would listen to some of the stories that Porter had to share you could hear history in the making. He used to say “We traveled with a five piece band in a 1941 Packard Hearse with my old stand up bass fiddle stuffed in the back”. My, how times have changed. Porter McDowell's music history is included in stories online at Hillbilly Music. the beginning of a family tradition that is still alive today.